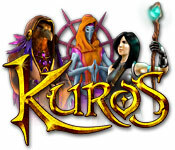 When Katya, a young explorer with no memory of her past, awakens on Kuros, she finds a mysterious alien world teetering on the brink of destruction. Determined to piece together her forgotten life, she sets out to explore her strange surroundings. With the guidance of six unique allies, help Katya explore five elemental realms and heal the mysterious and damaged glyphstones that govern the landscape in this exciting puzzle game! An evil dwarf collects the souls of those who enter the neglected park! Will you be able to rid the world of his presence?